Chili, that deliciously spicy Tex-Mex stew, can be good, bad or indifferent for constipation depending on the recipe. Traditional Texas chili con carne, or chili with meat, contains no beans, few vegetables and only a little dietary fiber. However, chili made with plenty of beans and vegetables contains ample fiber, which your digestive system needs to function smoothly and regularly. Constipation is characterized by fewer than three bowel movements per week that may be difficult or painful to pass. Constipation is a very common digestive complaint in the United States, and it usually resolves on its own without treatment. The main causes of constipation are consuming too little dietary fiber and too much meat, dairy and processed foods, not drinking enough liquids, putting off a bowel movement and inadequate physical exercise. Certain medications may cause constipation, and it's possible, though unlikely, that constipation could be a symptom of a more serious medical problem. To help resolve and prevent constipation, choose chili that contains beans and vegetables. One cup of canned chili con carne with beans contains nearly 10 g of fiber, and canned vegetarian chili with beans contains about the same amount. 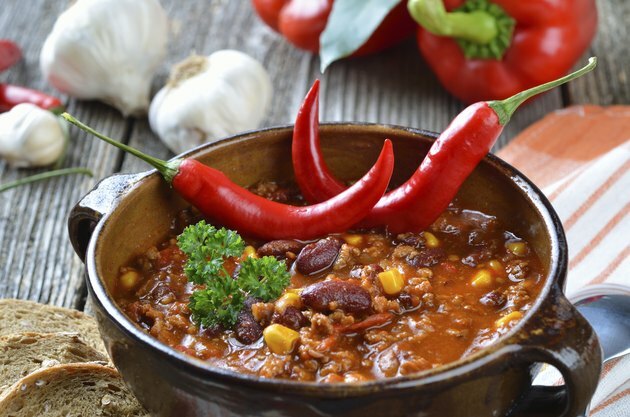 The American Dietetic Association recommends getting 20 to 35 g of dietary fiber per day, so a single serving of chili puts you well on your way towards meeting that goal. Canned chili without beans, on the other hand, contains only 3 g of dietary fiber per cup. The carbohydrates in beans and some vegetables can cause intestinal gas in sensitive individuals. If you're feeling bloated and uncomfortable with constipation, and if beans tend to give you gas, then chili may make you feel temporarily worse. In this case, try consuming dietary fiber that's mostly insoluble, such as that of wheat bran. The insoluble fiber in wheat bran produces little gas, explains the National Digestive Diseases Clearinghouse. Once your constipation has resolved, then include chili in your diet in small amounts to reap its benefits. Besides consuming adequate amounts of dietary fiber, other simple measures to treat constipation include drinking plenty of water and other liquids, getting regular exercise and taking time to relax. You should never suppress the urge to move your bowels, as this may contribute to the problem. A balanced diet that includes plenty of fruits, vegetables and whole grains will allow you effortlessly to meet guidelines for dietary fiber intake. If you experience constipation that is unusual for you, doesn't respond quickly to dietary changes or causes considerable discomfort, see your doctor to rule out other causes and complications. You should also seek medical advice before taking laxatives, if you suspect that a medication is causing your constipation or if you experience gastrointestinal symptoms, such as nausea, hemorrhoids, bloody stool, abdominal bloating or diarrhea in addition to constipation.